Switching It Up: An Electrician/Musician and Conservationist on Role Reversals and Resilience | Balancing Act | Kids VT - small people, big ideas! 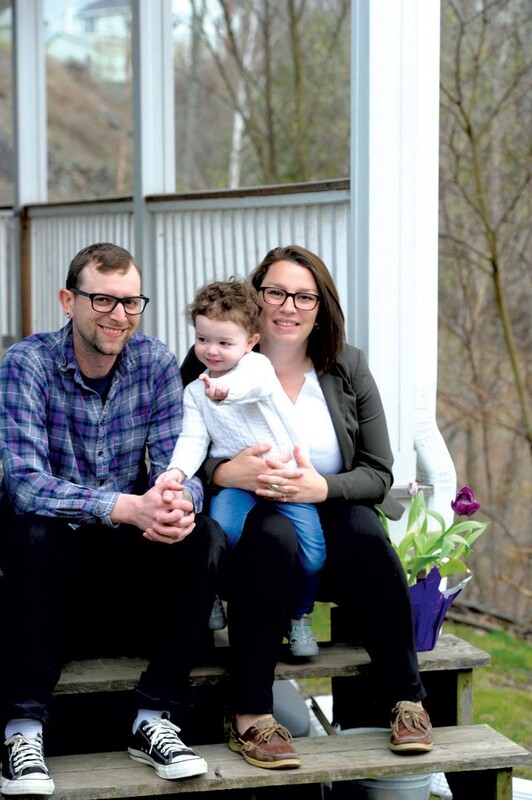 Before they were married, Marisa Riggi and Chris Gibbo talked about who might be the primary caregiver if they had a baby. The vivacious and professionally driven Marisa knew that she would want to continue working full-time. Chris, a musician who also works at his father's company as an electrician, was excited to be a stay-at-home dad. His calm and patient disposition and work flexibility made this a viable option. When Marisa number-crunched the cost of health insurance, student loan payments and daycare, the couple found a solution that made sense both financially and personally. Marisa works four 10-hour days at the Northeast Wilderness Trust and stays home with 2-year-old Maia one day a week, while Chris takes care of Maia four days and works one. The couple relocated to Barre from Burlington three years ago, which cut down both Marisa's commute to Montpelier and the cost of living. Chris: Marisa had a hard time — sometimes when Maia gets hurt and she would go for me and stuff like that. But last week on vacation, she was like "Mama, Mama" all the time, and I was like "Huh?" A lot of times when Marisa gives something to Maia, she will say, "Oh, thanks, Dada." Marisa: Because she's with him all day, so the "thanks" and "Dada" go together. And I'll be like "Who am I?" And she'll say, "Oh, thanks, Mama!" Chris: Marisa is a great cleaner and cook! (Laughter) There is a plan for everything. So a lot of times, when I start slacking on the cleaning details — I mean it's tough staying home — Marisa always reminds me of our schedule. Marisa: There is a cleaning schedule of what should be cleaned for [each] day of the week. My day home varies, and the day he's going to work varies, so the schedule is to keep us on track. Chris: It's mostly moms during the day, but most of my friends are women anyway. I'm used to it. I worked in an elementary school, and it was me and the girls having lunch. And I have the dogs and cats here in the house, and they are all female, so it's me and the girls. Marisa: It's an estrogen-heavy environment! Chris: We go to a playgroup in Montpelier on Tuesdays, and there are a couple of guys every once in a while, but it's usually me and the women. But I play in a band with guys, so I get that time, too. Marisa: I think coming home and seeing him and little munchkin being so happy, and the joy [Maia] feels — from a choo-choo train, pointing at the Statehouse or seeing a clock — helps me to feel more grounded and like Okay, appreciate the little things, and let go of the stuff you can't control. Her capacity to fall down and get upset and move on really quickly — she is really resilient — I think that in some ways helped me be more resilient at work. Things can get stressful — you know you're trying to make deals, make things happen and negotiating, and that can raise your adrenaline levels. Deep breathing and relaxing are things I have only incorporated since having Maia. Chris: I see you when you get home. She'll be in her car on her cellphone after work, and we are in here playing. And Maia always greets her at the window, and you can see the physical stress just fall off her when she sees Maia. Marisa: It's hard to be upset when you see this little face through the window screaming "Mama!" Marisa: I think most people occasionally feel like I'm doing everything! I need help! But we communicate a lot about how we are feeling and try to remind each other of what the other person is doing that we don't see. Things that he's doing during the day that I don't notice when I get home, or I do all of our finances, and that's a lot of stuff to do as well. We go back and forth and try to remind each other where that actual balance is. In general we have a pretty good balance. You're pretty great.